This salmon is quick and easy, but packed with flavor. If you have any extra sauce once the fish is covered, it goes great on sautéed greens, green beans, or asparagus. You keep the skin on the fish to help hold the fillets together while they cook, but since we aren’t doing anything here to crisp up the skin you’ll want to peel it off before serving. Preheat oven to 450 degrees Fahrenheit. Spray a small baking dish (whatever shape/size your salmon fillets fit in comfortably) with cooking spray. Place salmon skin-side down into baking dish, close together but without any overlap. Combine remaining ingredients in food processor bowl and pulse until well combined. 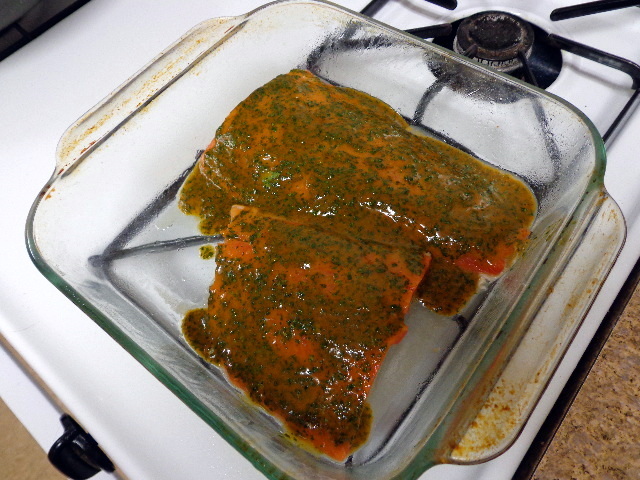 Pour sauce over salmon, spreading with a spatula as needed for even coverage. Allow fish to sit with sauce for 5 minutes. Bake for 12 – 14 minutes, until salmon flakes apart easily. Carefully remove skin before serving.